"Sand O! - Sand is an article of general use in London, principally for cleaning kitchen utensils. Its greatest consumption is in the outskirts of the metropolis where the cleanly housewife strews sand plentifully over the floor to guard her newly scoured boards from dirty footsteps, a carpet of small expense and easy to be renewed. 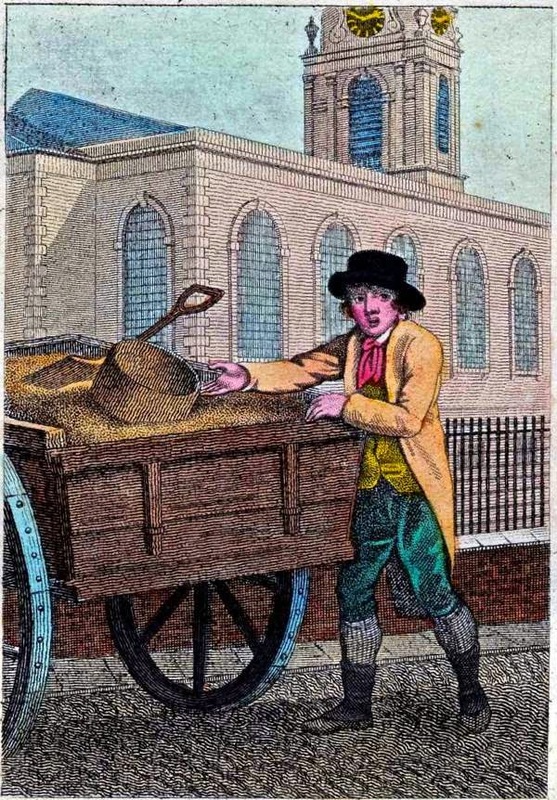 Sand is sold by measure, red sand twopence halfpenny and white five farthings per peck." "The first preparation for roasting is to take care that the spit be properly cleansed with sand and water; nothing else. When it has been well scoured with this, dry it with a clean cloth. If spits are wiped clean as soon as the meat is drawn from them, and while they are hot, a very little cleaning will be required." "The floors should not be often wetted, but very thoroughly when done; and once a-week dry-rubbed with hot sand and a heavy brush, the right way of the boards." To extract Ink from Floors. "Scour the place with sand wet with spirits of vitriol and water. — When the ink is extracted, wash the floor with strong pearlash water, and put the vitriol, “labelled,” where children cannot have access to it." "As soon as the leaves begin to turn yellow, the roots can be taken up in a dry day. Cut the tops off about an inch from the crown, and pack the roots in dry earth or sand in the cellar, for Winter use." Take fine dry sand, that has little or no saltness in it, and make it as dry as possible with often turning it in the sun; gather your fruits when they are just ripening, or coming near ripe, and dip the ends of the stalks in. melted pitch or bees-Wax; and having a large box with a close lid, dry your fruit a little in the sun to take away the superfluous moisture, and lightly spread a. layer of sand at the bottom of the box, and a layer of fruit on it, but not too near each other; then scatter sand very even about an inch thick over them, and so another layer till the box is full; then shut the lid down close, that the air may not penetrate; and whenever you take out any thing, be sure to mind the placing them even again, so you will have them fit for tarts, or other uses, till the next season; if they are a little wrinkled, wash them in warm water and they will plump up again: you may use millet instead of sand, if you think it more convenient." "They should be kept very clean, and the bottom of the dovecote be strewed with sand once a month at least." Image from - William Marshall Craig. Itinerant Traders of London in their Ordinary Costume with Notices of Remarkable Places given in the Background. 1804.